Earlier this year, my brilliant business partner, Debi Schadel, started forwarding me a Seth Godin blog post every so often -- when the content serendipitously matched a macro dialogue we had just been having on best practices, client relations management, etc. Sitting by the pool during a recent strategy meeting with one of our fiercest new interns, Kat Baxter -- a big proponent of reading Seth's Blog -- I was finally convinced to subscribe to Seth's daily posts of macro-view business wisdom. 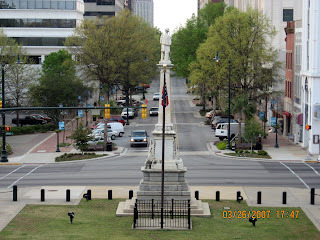 Today's post on Seth's Blog is great, in particular, not just because of its graceful nod toward 9/11, but mainly because the golden glow emanating from the city of Columbia, SC is a hot topic right now in just about every conversational circle I encounter. "I got to thinking about why New York City attracts so many tourists, more than just about any city in the world. Not because of natural wonders or even outdoor sports activities. It might be because:..."
"...The thing is, here can be anywhere. There are New Yorks going on in towns large and small, in companies big and tiny and in families that support and respect at the same time they embrace and encourage difference..."
"...But now more than ever, I believe we have an obligation to stand up, stand out and to do work that matters. Wherever you are, there's an opportunity to be different, with respect." Think about this in relation to your city, especially if you happen to be one of my South Carolinian brethren. Are you standing up and standing out? A lot of you really, really are. And it's making a huge difference in quality of life for everyone around you. I am so inspired by my colleagues, friends, family, clients, mentors and heroes on a daily basis. Something Great is happening. And we're all a part of it. So what do we do about getting that Confederate battle flag off of the S.C. State House grounds? It's holding up economic progress for our city, while convention after convention declines Columbia as a location because of the flag. Seriously, y'all. What can we do?